January 19, 2011 /58 Comments/in Featured Articles, Jewish Self-deception, Jews in Economy/Finance /by Edmund Connelly, Ph. D.
John Graham’s writing on Jews and financial misbehavior is priceless, beginning with the must-read article he co-wrote with Kevin MacDonald, Is the Madoff Scandal Paradigmatic?. This week Graham brings us Did Schumer Shill for Madoff?, which strongly suggests that New York Senator Charles Schumer was complicit in the massive financial swindle perpetrated by co-ethnic Bernie Madoff. If Graham is correct, it wouldn’t be surprising if Schumer was not alone among high-level Jews in the American government whose actions benefited the financial sector — an area where it is widely acknowledged that Jews predominate — at the expense of the American economy as a whole. Here I’m going to use work by trade expert Clyde Prestowitz on Larry Summers, Robert Rubin and Alan Greenspan. Prestowitz came to the world’s attention with his 1988 book Trading Places: How We Allowed Japan to Take the Lead. This was followed by other big books such as Rogue Nation: American Unilateralism and the Failure of Good Intentions (2003), Three Billion New Capitalists (2005), and The Betrayal of American Prosperity: Free Market Delusions, America’s Decline, and How We Must Compete in the Post-Dollar Era (2010). I’ll be splicing together information from the three books written after 2000. Prestowitz was born in 1942 and grew up in Wilmington, Delaware, the son of a chemist. He describes himself as “The product of a middle class, conservative, rock-ribbed Republican, superpatriotic, born again Christian family.” A former high-level businessman turned trade official in the Reagan Administration, Prestowitz has succeeded in carving out a niche for himself as one of the most insightful commentators on America business and trade. In 1989 he established a Washington, D.C. think tank, the Economic Strategy Institute (ESI). Further crises erupted that involved “the three apostles.” Long-Term Capital Management, a hedge fund, faced the prospect of losing $1 trillion dollars that it had borrowed from the largest American banks. “It threatened to freeze world money markets and precipitate a 1929-style crash and perhaps another depression.” Awkwardly, Greenspan, Rubin, and Summers “were in the process of halting a measure that would have put some constraints on the very kind of risky derivatives trading that was bringing LTCM to its knees.” Meanwhile, they continued to discourage the oversight of Brooksley Born, Chairwoman of the Commodity Futures Trading Commission. Summers had even phoned her and sharply criticized her actions. This was followed by Greenspan, Rubin and Arthur Levitt of the Securities and Exchange Commission pressuring Congress to straightjacket Born. This persisted into 2000, as Greenspan continued to insist that Wall Street should be trusted and left to its own devices. “With those assurances, Congress went ahead and stripped the CFTC of responsibility for derivatives, and President Clinton signed the bill into law in December 2000.” Meanwhile, Ms. Born quietly left government service. Prestowitz notes that LTCM faced failure when the Russian government defaulted in October 1998. Interestingly, Summers has been accused of playing a role in the massive defrauding of the Russian people as well. Retired professor James Petras claims that former President Clinton and his economic advisers backed the regimes that allowed the plunder of Russian wealth. Though relegated to an endnote, he names Andrei Shleifer and Jeffrey Sachs as those involved. Petras shows that Harvard paid $26.5 million to settle a suit stemming from various improprieties associated with Harvard professors. Steve Sailer, in The real Larry Summers scandal? wrote that the upshot of the scandal was that the “reform” of the Russian economy “turned out to be one of the great larceny sprees in all history, and the Harvard boys weren’t all merely naive theoreticians.” The 45-year-old Shleifer, though Russian, nonetheless vacationed each year with Summers, which may explain why Shleifer has remained on the Harvard faculty. perhaps the greatest intellectual fraud of the 20th century — a set of beliefs that explained everything but had only the most tenuous connection to reality and an ideology that empirical research was for bean counters. The same thought crossed my mind while reading Thirteen Bankers, by Simon Johnson and James Kwak. 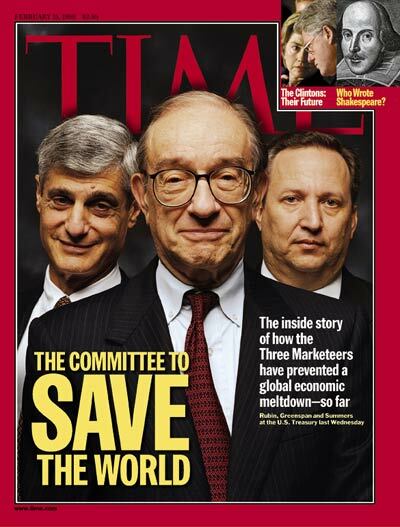 Near the heart of the financial meltdown was the towering self-confidence of Larry Summers, Robert Rubin and Alan Greenspan in opposing any regulation on the derivatives market. Summers seems to be pivotal. When Brooksley Born, head of the Commodities Futures Trading Commission, proposed that some thought should be given to regulation, Summers reportedly said “I have thirteen bankers in my office, and they say if you go forward with this you will cause the worst financial crisis since World War II.” As Johnson and Kwak note (p. 9), we don’t actually know if there were any bankers in Summers’ office; “more likely he came to his own conclusion.” The point is that Summers had an unshakable faith that what he was saying was correct — a faith that was ominously unrelated to empirical reality. Nevertheless, Ms. Born was successfully pushed aside and ultimately a law was enacted preventing any regulation of the derivatives market. Prestowitz shows how both Rubin and Summers, upon leaving the government, continued to push reckless paradigms. As vice chairman of CitiGroup, Rubin “emphasized to the bank’s leaders that if they wanted to make more money they needed to take on more risk by dealing more heavily in derivatives.” For his part, Summers worked for the D. E. Shaw hedge fund, while also teaching at Harvard. More broadly, Prestowitz finds the three apostles were joined by others in making what he views as alarmingly poor decisions. One such was the decision to bring China into the World Trade Organization and granting China “permanent most favored nation status in the U.S. market. This will surely come to rank as one of America’s dumbest deals.” For this, he blames President Clinton, but also trade representatives Mickey Kantor and Charlene Barshefsky. The most visible public invocation of Barshefsky’s Jewishness ironically almost seemed to negate it. Before the start of fall classes in 2002, Harvard President Lawrence Summers controversially reflected on what he regarded as the resurgence of antisemitism at his university and around the world. The Jewish Summers — who had himself served as secretary of the Treasury — argued that the rise of anti-Jewish sentiment contrasted with the historically significant lack of concern when Bill Clinton appointed a “very heavily Jewish” lineup of economic policymakers that included not only Barshefsky but also Treasury secretary Robert Rubin and Federal Reserve chairman Alan Greenspan. In this narrative, the career of Charlene Barshefsky became simply one more sign of the successful assimilation of Jews into the top leadership of the United States. Despite Prestowitz’s disclaimers to the contrary, I’m suspicious when he writes in the space of a few paragraphs about a group of people making what he feels are bad decisions. In the one paragraph that contains Barshefsky’s name, Prestowitz writes of the following Jews, in this order: Mickey Kantor, Barshefsky, National Security Adviser Sandy Berger, NSC China expert Ken Lieberthal, finishing up with Rubin and Summers (Betrayal p.141). A coincidence? How fitting that he writes about them in a book where the word ‘Betrayal’ is part of the title.